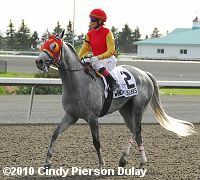 There are two other graded stakes races on Woodbine Mile Day. 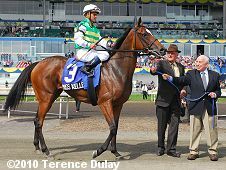 The co-feature on Sunday was the $750,000 Northern Dancer Turf Stakes (G1) for older horses going 1 1/2 miles, one complete lap of the E.P. Taylor Turf Course. This event is the major local prep for the Pattison Canadian International (G1) on October 16, which is Woodbine's "Win and You're In" race for the Breeders' Cup Turf. A field of 9 went to post with European invader Redwood sent off as the 9-5 favorite off a 2nd place finish in the Grand Prix de Deauville (G1), a win in the Glorious (G3) at Goodwood, and a 2nd in the Princess of Wales (G2) at Newbury. In to challenge him included last year's winner (on appeal) Marsh Side as the 2-1 second choice, winner of the Sky Classic (G2) last out, and 7-2 third choice Spice Route, winner of the Singspiel (G3) over the same course and distance on Queen's Plate day. Down the stretch with Redwood on the rail catching pacesetter Fifty Proof and Windward Islands in third. Jockey Justin Stein sent 29-1 Fifty Proof to the lead on the clubhouse turn and he set early fractions of 25.24, 51.20, 1:16.25, and 1:41.12, over the firm turf while being pressed by Marsh Side a length behind. On the turn, Marsh Side tired to eventually finish 8th, allowing Fifty Proof to open up a 1 1/2 length lead on favorite Redwood at the top of the stretch through 1 1/4 miles in 2:05.42. Fifty Proof stubbornly held onto the lead to the 1/8 pole, but Redwood was up to the task, coming through on the inside to prevail by 1/2 a length in 2:28.97. It was another 1 1/4 length back to 19-1 Windward Islands third. Left: Redwood in the winner's circle. Lord Grimthorpe, racing manager for Juddmonte Farm in Europe said, "Obviously it is up to Prince Khalid but the horse travelled very well out there so providing he travels back all right the options are there. 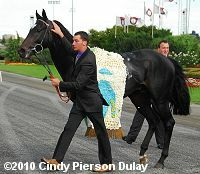 I doubt he would do both (the Canadian International and the Breeders' Cup Turf. I think he might have been a bit more impressive if they had gone a bit faster, but the only worry really was whether he was going to get through. Barry (trainer Hills) has always been very keen on him, particularly in the last couple of months and his form is cast-iron." Right: Redwood heads back to the barn. 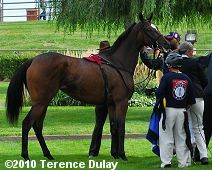 Left: Redwood in the paddock before the race. 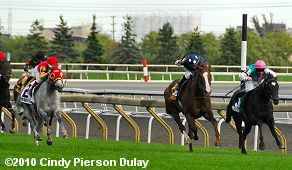 His jockey Michael Hills said, "They told me it was a fresh patch (along the rail). I was under no fixed plan but when I got to the rail it was golden. Good, beautiful ground to be honest, so I took the inside run. The English horses like that. It was a perfect passage. I just told him, 'Go do your thing.' It's a beautiful track to ride on." Right: Redwood returns after the race. 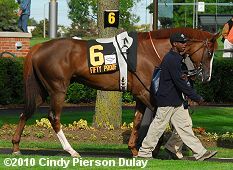 Left: Second place finisher Fifty Proof in the paddock. The 29-1 longshot set a reserved pace under regular rider Justin Stein, was collared at the 1/8 pole and gave way grudgingly, finishing second beaten just 1/2 a length in his stakes debut. The Ian Black trainee improved his record to 4 wins, 3 seconds, and 0 thirds in 8 starts, earning $365,040 for owner Kinghaven Farms. Right: Third place finisher Windward Islands returns after the race. The 19-1 shot stalked the pace 2 lengths behind the leaders under regular rider Chantal Sutherland, came out at the top of the lane and ran on well to hold third beaten 1 3/4 lengths at the line. The Mark Frostad trainee improved his record to 5 wins, 4 seconds, and 2 thirds in 19 starts, earning $655,893 for owner Sam-Son Farms. 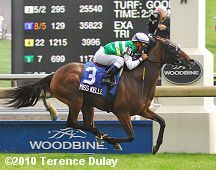 Kicking off the stakes action on Woodbine Mile day was the $300,000 Canadian Stakes (G2) for older fillies and mares. This is the major local prep for the E.P. 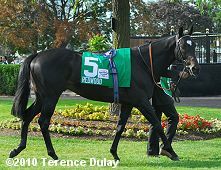 Taylor Stakes on the Canadian International undercard, Woodbine's "Win and You're In" event for the Breeders' Cup Filly and Mare Turf. Just 6 went to post in this "about" 1 1/8 mile turf event around 1 turn, with Miss Keller sent off as the 8-5 favorite off a second place finish in the Ballston Spa (G2) at Saratoga. In to challenge her included European shipper and 9-5 second choice Latin Love, winner of the Kilboy Estate Stakes at the Curragh last out, and 5-2 third choice Points of Grace, an allowance winner last out after finishing third in the Dance Smartly (G2). 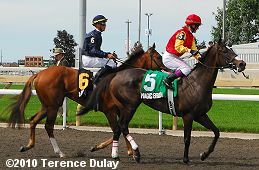 Jockey Patrick Husbands sent Points of Grace to the lead exiting the chute and she set slow early fractions of 24.69 and 48.33 over the turf course still rated good (upgraded to firm after the race), while being pressed by 7-1 Magic Broomstick second and Latin Love third. Entering the stretch, Points of Grace stubbornly continued to lead and a short battle with Latin Love ensued. 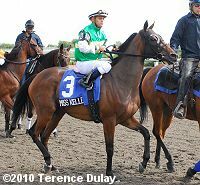 However, the pace battle set the race up for Miss Keller, who came through between horses from fourth to win going away by 1 3/4 lengths in 1:45.84. It was a long 5 lengths back from Latin Love to Magic Broomstick third, while pacesetter Points of Grace tired to finish fourth. 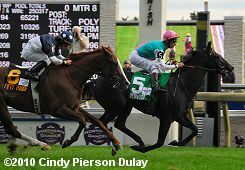 Right: Jockey Javier Castellano and Miss Keller are led to the winner's circle by trainer Roger Attfield (brown hat) and Phillip Solonz of Three Chimneys (right). 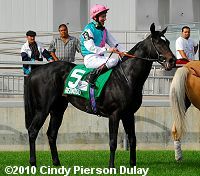 Right: Miss Keller gets saddled before the race. Second place finisher Latin Love (6) and third place finisher Magic Broomstick (5) return after the race. 9-5 second choice Latin Love sat in midpack 3rd just 2 lengths off the pace under new jockey Garrett Gomez, gained a short lead at the 3/16 pole but was easily passed in the final furlong. The David Wachman trainee improved her record to 3 wins, 3 seconds, and 2 thirds in 16 starts, earning $213,352 for owners Mrs. John Magnier and Michael Tabor. 7-1 fourth choice Magic Broomstick pressed the pace in second early under new jockey Chantal Sutherland but flattened out in the stretch to finish third beaten 6 3/4 lengths. The Mark Frostad trainee improved her record to 4 wins, 1 second, and 2 thirds in 9 starts, earning $209,940 for owner Sam-Son Farms.